The very first Wash Family Spice Burger was born in Glasmerin in the early 50's by Maurice Walsh, a butcher by trade. Created from a secret blend of herbs, onions and Irish beef, it soon become a favourite with all his regular customers. 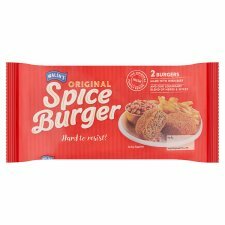 Today we still use the very same recipe to bring you the famous Walsh Family Spice Burger...enjoy! This product may contain bone. Delicious served with potatoes and vegetables, or as an accompaniment with a grilled breakfast. Keep refrigerated between 0ºC and +5ºC. Once opened, eat within 24 hours. Consume on or before 'Use By' date. This product has previously been frozen and is not suitable for freezing. These times are a guide only. Appliances may vary. 1 minute and 15 seconds (800W). 18 minutes in a 170ºC preheated oven.